What sews up quicker than you can say “ladies jersey skirt sewing pattern”? Not quite this Stevie skirt but it does come in at a very close second! The lovely and extremely comfortable knit skirt embodies simplicity and style. 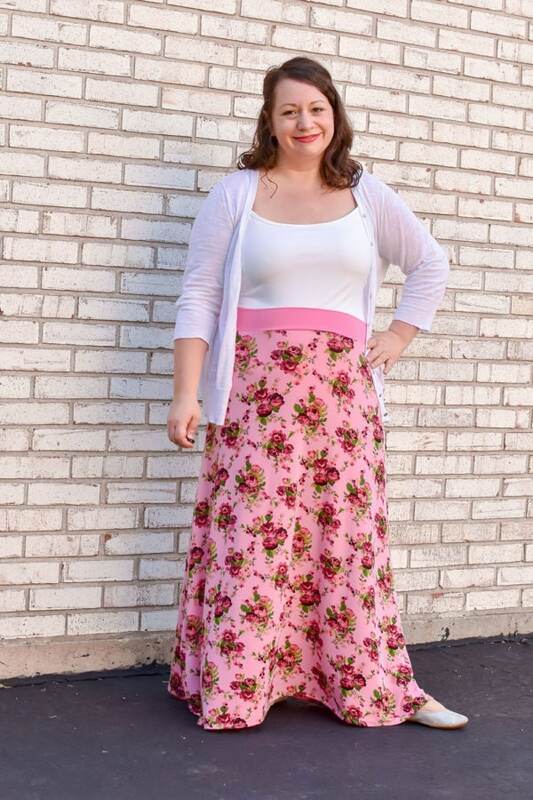 A quick, easy sew, with uncomplicated instructions and basic pattern pieces to get you skirted and out the door to show off your brand new skirt – while fabric shopping for more Stevies-, obviously! This little skirt went together so easily and turned out so well!!! Super quick as well! A beautiful classic skirt silhouette! A very straight forward pattern and easy to follow. I can see this being a skirt that transitions very well from a work to a more casual environment! A super quick sew perfect for beginners. The type of knit fabric will determine the fit so choose with the required stretch. The stevie skirt is ideal as a casual every day skirt but dressed up can be most suitable for a dressier occasion. Awesome , simple and quick to sew.. a wardrobe must have! The Stevie is an awesome pattern for beginners and those looking for a fast sew with amazing results! There are lots of length options so everyone can find one they like. I can’t wait to make more! This skirt is so amazingly fast to sew. The fit was spot on and it is comfortable to wear. Its simple but classic shape is perfect for special fabric that you want to showcase or just as a basic skirt to round out your wardrobe. I have a few more planned and I imagine my closet will fill up with Stevie Skirts! This skirt pattern is so versatile and packed with options! I love it! It is a super fast sew and quick and sure success for very beginners, too. I love this skirt! It really is the quickest sew ever! Probably less than 30 mins from printing to having a wearable new item in my wardrobe! This is such a flattering skirt, nicely hides my non-pregnant pregnant looking tummy and gives a beautiful a line shape flare to your wardrobe. This is a great beginner pattern. It is quick with flattering results. I could fill my closet with these skirts. 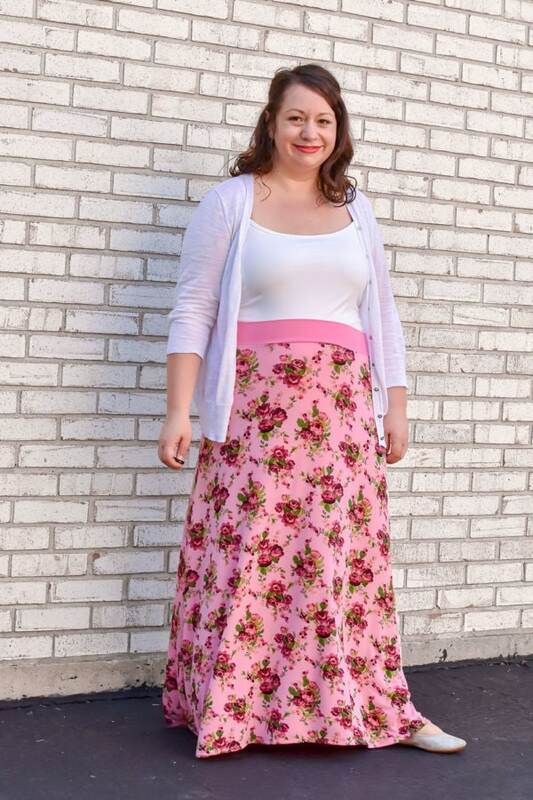 The Stevie Skirt is an easy wearing, quick sew lovely skirt with a comfortable yoga waistband. With four length options it goes any and everywhere! I sewed it up in 30 minutes to wear to a brunch; quicker than doing laundry! I made the maxi skirt in Liverpool and it was so quick and easy. I love the way it flows! Love this skirt! Just a quick sew and the skirt looks lovely as a casual wear. This is a fast and easy sew with great results. Fit is perfect. Instructions are easy to follow even for knit beginners like me. This was such a quick sew! The maxi length is so flattering and takes no time at all to create! I can’t wait to make a bunch more of these! This is the simplest skirt ever! I love it, depending on what fabric you use, there could be a total of 4 seams if you don’t hem it. Such a lovely skirt to wear and can be formal or casual depending on your fabric choice. I see many, many more of these in my wardrobe very soon! This skirt, the first time I made it, was done in under an hour including putting the pattern together! It tends to take me a long time to complete projects, but this one was super fast, cutting out and pinning took up most of the time. I’m looking forward to adding many more Stevie skirts to my collection! This was super fun and quick to sew! Even though it was knit, which made it a bit trickier, it was worth it! Super flattering! The Stevie was a very simple sew, but would be one of those patterns that would fool someone into thinking you are a really great seamstress! The directions are straightforward and easy to follow. You can use any knit fabric. The different lengths open things up so much. If you want a party skirt, go for above the knee. If you need every day wear, you might want maxi length to wear with boots. This is a very versatile skirt. I will definitely be making it again! My daughter loves to wear skirts and this pattern has been great to use for all of her favourite knit fabrics. She even has made one herself. Love the yoga waistband! With only 3 seams and so many hem lengths, this skirt has become a staple in my wardrobe. I can whip one up in 10 minutes (including cutting the fabric)!! An amazingly quick but extremely versatile skirt pattern! With a choice of lengths and option of using differing types of stretch fabric, I can’t wait to make many more! 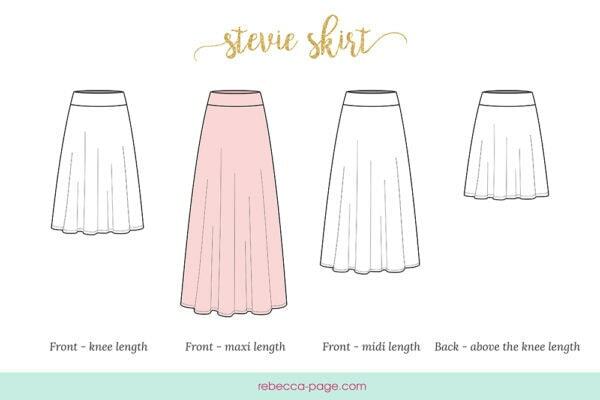 This is such an easy, cute skirt pattern. I love the options for length and how quickly it was to sew together!